Francis Ford Coppola's "The Godfather, Part II," a Paramount Picture, starring Al Pacino and Robert Duvall, Diane Keaton, Robert De Niro, John Cazale, Talia Shire and Lee Strasberg, opened in 1974. Conceived by producer-director Francis Ford Coppola as a companion piece to the original, "The Godfather, Part II" does not simply continue the story of the Corleone family, but envelops them in a chronicle that covers almost three generations of successive power. As before, Coppola has collaborated with Mario Puzo, on whose novel the screen characters are based and with whom he shared an Oscar for Best Screenplay of "The Godfather," which also won a Best Actor Award for Marion Brando and Best Picture of the Year Oscar. is Al Pacino, two-time Oscar nominee for his portrayals of Michael and the title role of "Serpico." Diane Keaton returns as his New England wife Kay. Tom Hagen the adopted brother and Michael's consigliere, is once again portrayed by Robert Duvall. To play the 25-year-old Vito (portrayed by Marlon Brando in "The Godfather") in flashback sequences, Coppola chose Robert De Niro, who won critical acclaim for "Bang the Drum Slowly" and "Mean Streets." 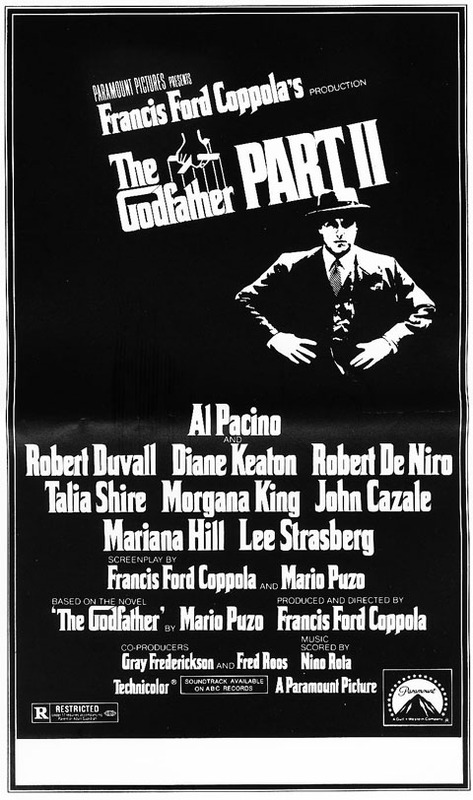 Others in the cast of "The Godfather, Part II" include Michael V. Gazzo, G. D. Spradlin, Tom Rosqui, Richard Bright, Gastone Moschin, Bruce Kirby, Jr., Frank Sivero, John Aprea and Morgana King. The music, as in the original, is composed by Nino Roto with other music contributed by Carmine Coppola. Costume designer is Theadora Van Runkle. Associate producer is Mona Skager. Young Clemenza .......................... B. KIRBY, JR. The producers would like to thank JAMES CAAN for his special participation in this film. of the people of the Dominican Republic for their help in filming portions of this motion picture. Certain scenes filmed at Embajador Hotel, Santo Domingo, Dominican Republic.